Business Debt Restructuring is a process allowing companies to reduce or negotiate its overdue debts. By using debt restructuring, companies are allowed to default on existing debt and take advantage of lower interest rates. Businesses are motivated to use business debt restructuring because it allows a reduction of the debt with an extension of payment terms, allowing it to be less expensive and an alternative to bankruptcy. Businesses are able to reconstruct, relocate or change their debt by altering the terms of their existing debt with no reputable damage to their business in their industry. Business Debt restructuring is an adjustment that must be reached by both parties—the creditor and the debtor. Two types of debt restructuring exist. The creditor does not realize any losses during general debt restructuring. This type of restructuring is able to occur when the creditor extends the loan period or lowers the interest rate—allowing the debtor to temporarily gather him or herself financially then pay their debts later. Troubled business debt restructuring results in a loss to creditors during the process. This happens when the creditor receives less than the original value of the investment. Business Debt Restructuring depends on many factors—the debtor’s financial management, the expected cash flow, and the relationship between the creditor and debtor. 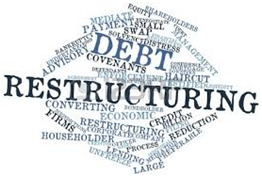 The process of debt restructuring is meant to help both the creditor and debtor. There has to be compromise from both parties. The creditor needs to be willing to allow an adjustment to the initial investment. The debtor needs to repay the debt in full to the creditor without mishaps. Business Owners nationwide are seeking help from accredited debt relief agencies for fiscal aid. Our St. Louis agency is the most trusted in the industry nationwide. Allow us to help you save your business. We will provide strategies, insight, tips, support, management and budgeting education to assist you in keeping your business. If you feel business debt restructuring is the adequate decision for you fiscal needs, you need to seek the advice of a debt analyst or debt advisor. The first step to debt recovery starts with reaching out for help. Our team is here to help remove the weight of debt. Please contact us for a FREE Advising Session.